A new day is dawning as the sun rises over the horizon. The possibilities for your new day are endless, and the rippling impact is a win-win-win. Movement and care bring coffee from seed to cup and support the development of healthier communities, stronger economies, and endless possibilities. Allow us to take you on a journey of love and care from our Guatemalan family to yours. The adventure to unfold offers you a glimpse into the heart of the people and how movement and care in the coffee process brings a fresh, delicious pot of coffee to a cup near you. It begins with a seed, a what if idea, and a new day. 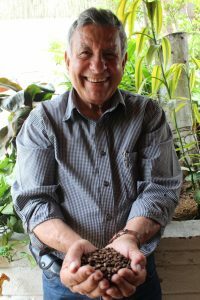 They develop and grow into a grano maduro (red grain or coffee cherry), an enriching global community collaboration, and endless possibilities through that delicious cup of Guatemalan coffee. All in efforts to help us increase access to quality rehabilitation medicine and to see a clinic in every community, and community in every clinic. Let’s start with the cultivation, harvesting, and processing of the coffee from seed to roaster. 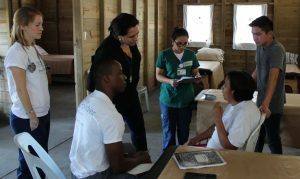 The Higueros family at Finca La Unión in Guatemala open their home, hearts, and farm to our Clinic Development Program (CDP). 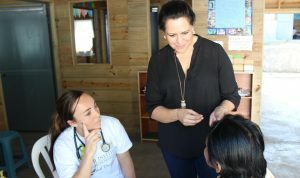 CDP experiences immerse us into the world as we learn and experience the culture and life of the people and communities we are collaborating with. 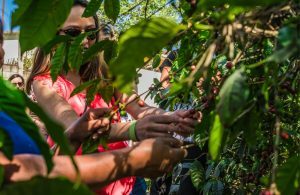 The Higueros family walks us around the farm: showing, describing, and allowing us, in season, to experience the coffee process. We have had the opportunity to harvest, rake the parchment coffee as it dries, and enjoy a family cooked lunch on the patio. Through their voices and smiles, we experience firsthand the love and passion put forth in producing this exquisite coffee. 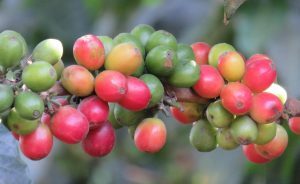 The journey begins with the seed that was nurtured from a previous harvest so that it may produce a fruitful coffee plant. 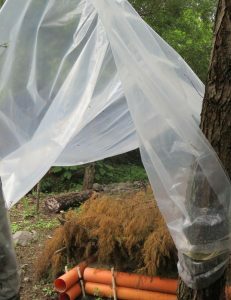 The seed is planted in a soil, white sand mixture and then covered for 4-months. 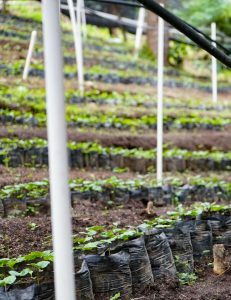 This starts the seed’s 2-year development towards becoming a hearty coffee plant for planting in the field for harvesting. 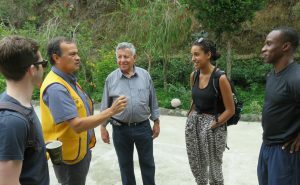 The Higueros family and the Guatemalan people then attentively care for the seed and maturing plants. There are 4-stages to the initial growth and development. 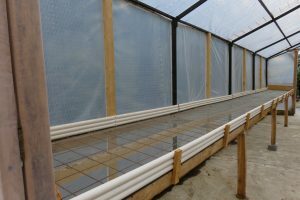 Each stage includes the continued assessment of the plants, and between stages, the plants are manually moved from one area of the incubating process to the next. 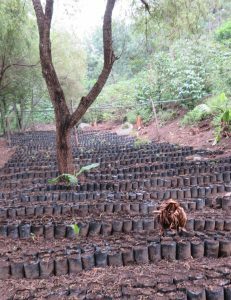 The 4-stages together last approximately 2-years: approximately 4-months covered, 1-month uncovered in the shade, 4-months covered, and 1-year in the almácigo (seedbed). After approximately 2-years, the people plant the maturing coffee plant (cafeto) in the field, which is on hilly terrain. 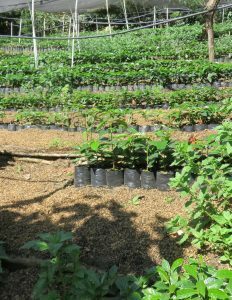 Once planted, the cafeto continues to mature and grow for another 2-years before producing quality fruit for harvesting. 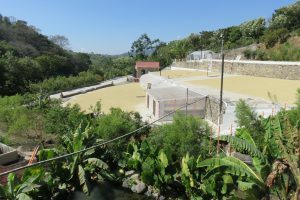 The Guatemalan people don’t need modern scientific tools to understand the life cycle of the maturing plant. 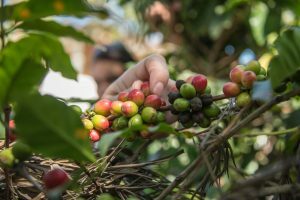 From experience and knowledge shared over the years, they can see from the features of the plant, like the size, how old it is and when it will produce ripe red grain (grano maduro) or coffee cherry for harvesting. The seed sown and nurtured with care and movement 4-years later now flowers and grows a green grain (grano verde) which matures into the grano maduro for harvesting. The Guatemalan people come from near and far to selectively handpick the beautiful red grains from the cafeto. Art and skill are required for picking, from the knowledge of ripe grains/cherries to the gentle movement and touch of the fingers harvesting only the deep red grains while leaving the others for a future round of picking. As the people harvest the grano maduro, they place them into a basket and then carry the basket on their head or in their arms to be weighed and processed. Each person on average picks 1 quintal (100 pounds) of grain per day which begets about 20 pounds of coffee beans. Each plant produces 1 to 2 pounds of coffee. Therefore on average, each person harvests 10 to 20 plants per day. The days harvest is collected, soaked, and washed for approximately 3 hours to preserve the freshness. 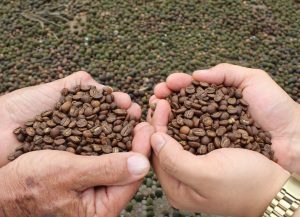 Then the grain follows one of two paths: natural coffee or café pergamino (parchment coffee). 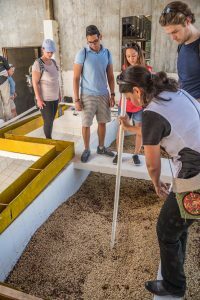 The natural coffee maintains the pulp on the bean and is taken to the solar dryer or African bed to be dried for 15 to 20 days before removing the entire hull to reach the café oro (green coffee) beneath. The other path separates the skin and pulp (la pulpa) leaving the mucilage, outer pectin layer, and the parchment. The coffee is rinsed and moved into a fermenting location for 36 to 48 hours. The fermentation stage dissolves the mucilage. and we now have the café pergamino (parchment coffee). The parchment coffee is rinsed, and the lighter not of quality coffee floats to the top while the heavier ripe coffee settles to the bottom and is taken to dry. 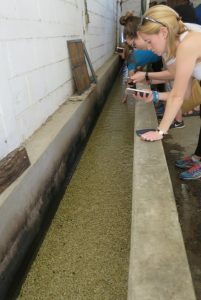 The water throughout the process is sourced locally from a neighboring mountain. 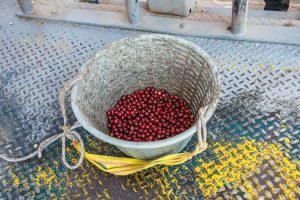 The ripe parchment coffee is scooped into containers and distributed across the large patio for drying. 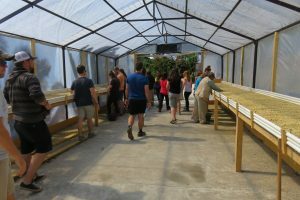 The distribution is a manual walking process across the patio leaving a trail of café pergamino, which is further distributed by raking and smoothing it into a single layer. 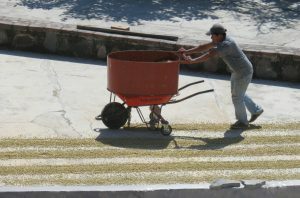 It remains on the patio drying for 7-days and raked regularly by hand to turn the parchment coffee over, so it is evenly dried and not scorched by the sun. 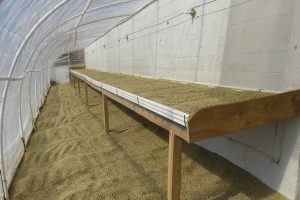 The coffee may also be dried in solar dryers (African beds) or mechanical dryers (Guardiola), if necessary. 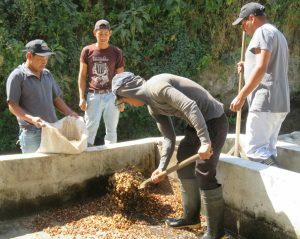 The coffee in the solar dryers is also carefully cared for assessing the state of the parchment coffee in the drying process. Then the coffee is placed in a control room that is heated for 15-days to finish drying. There is one final step for the coffee before roasting. 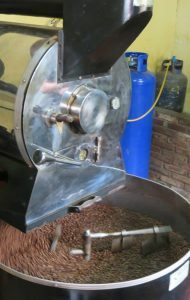 The café pergamino goes through a threshing process that removes the outer shell leaving the café oro (green coffee). The café oro is the innermost bean of the coffee grain that encapsulates the rich coffee flavor. This flavor is released in the roasting and subsequent brewing process for that fresh cup of Guatemalan coffee. We now have two types of coffee, natural coffee and parchment coffee, ready to roast. A little over 4-years later, the coffee seed has matured into a fruit-bearing plant; the grano maduro/coffee cherry has been harvested and processed; and now the café oro awaits roasting, packaging, and delivery to a doorstep or office near you. That rich, bold taste comes through the hands, hearts, and movement of the Guatemalan people. They know the qualities, the indications, and the caring ways to bring that delicious coffee bean to a cup near you. Our Guatemalan family does not stop at quality care and love for the cultivating, harvesting, and processing of the coffee, but extends further to the roasting, packaging, and delivery of that fresh Guatemalan coffee to a doorstep or office near you. 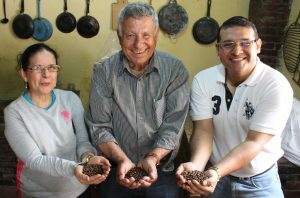 Our collaborative partnership with Evelyn Paiz and Papa’s Legacy Coffee in Guatemala brings a rippling win to the local Guatemalan economy, the Guatemalan people, and those who experience the fresh cup of Guatemalan coffee from Papa’s Legacy. 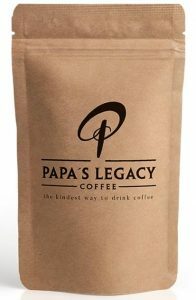 Papa’s Legacy began as Papa discovered in his 50 years of traveling across Guatemala that the secret to happiness was in that quality, fresh cup of Guatemalan coffee. Therefore, he wanted to bring that happiness to others and started a business to deliver that quality roasted coffee to a doorstep or office near you. 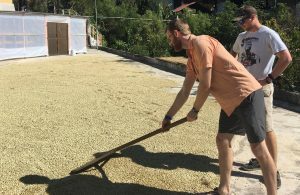 Papa’s Legacy does not grow or roast their coffee, but together with local Guatemalan coffee farms and a special roastery, they collaboratively find, produce, roast, and deliver that quality coffee bean. A quality roast comes from the care, heart, and knowledge of the women. 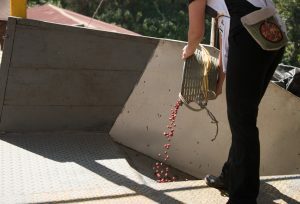 The roastery, Papa’s Legacy collaborates with, employs women who previously worked on coffee farms harvesting the beans. These women have all the necessary knowledge about coffee to roast and package that quality coffee bean. Though they have little to no formal education, they are the mind, heart, and labor that brings that cup of coffee to a cup near you each morning. Quality also comes in the freshness of the roast, which is done directly before packaging and delivery to you or your family and friends doorsteps. Papa’s Legacy Coffee not only partners with local Guatemalan coffee farms and roasteries that are providing quality jobs for the people of Guatemala. 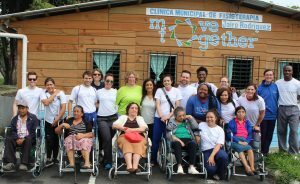 They also work to stimulate growth and healthier communities by giving 25% of the coffee purchases proceeds to high-impact for purpose organizations, like Move Together. We in return are able to give back to the local economy and the people of the world as we fulfill our mission and vision with the help of your Papa’s Legacy Coffee purchase. You may not be able to journey afar with us, but the impact of that delicious cup of Guatemalan coffee can be seen around the corner and around the world. 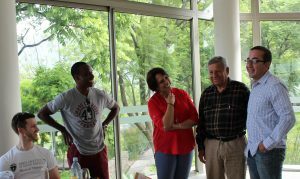 Thanks to Evelyn, who has been a foundation for us in Guatemala. 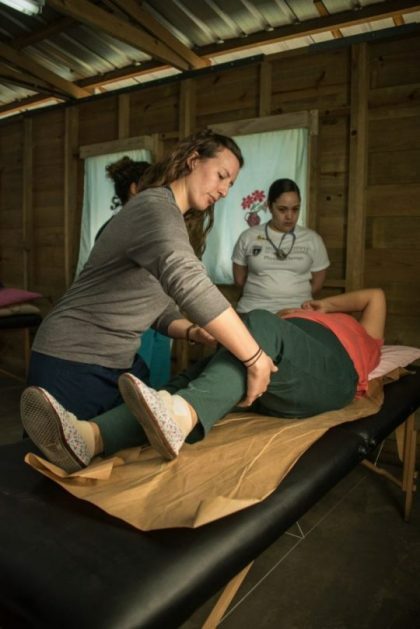 She has helped us build and develop relationships with leaders, community members, and the physical therapy profession throughout Guatemala and helped to lay a foundation and framework for our Clinic Development Program. The framework and foundation will help us to catalyze and develop similar programs around the corner and around the world. 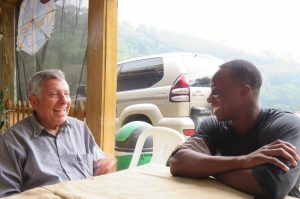 As we collectively increase access to quality rehabilitation medicine and embody community in and out of the clinics, happiness explodes as people have new hopes and possibilities from that cup of Papa’s Legacy Coffee enjoyed and its rippling impact. for you who purchase for personal consumption or to share with friends and family, you are helping to support the first 2-wins and also experience the happiness of that delicious cup of Guatemalan coffee. 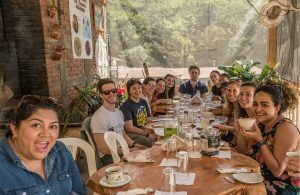 Happiness personally experienced by drinking it yourself or happiness accompanying and seeing another’s happiness as they enjoy that fresh cup of Guatemalan coffee. To hear more about the partnership between Move Together & Papa’s Legacy Coffee watch this video by Evelyn Paiz, Papa’s Legacy, and Josh D’Angelo, Move Together, as they share about the win-win-win nature of our collaboration. To purchase your Papa’s Legacy Coffee click here and share with friends and family the global win-win-win of a cup of Guatemalan coffee. Also, we would love to hear your stories of Papa’s Legacy Coffee and the happiness found in that delicious cup of Guatemalan coffee so please leave comments below.